St. Edmund the Martyr was King of East Anglia from 855-870. Though his life was brief (840-870), he accomplished many great things and ruled in the tradition of the great Anglo-Saxon monarchs like St. Edward the Confessor and Alfred the Great, both his successors to the English throne. Though only fifteen when he took the throne, he showed a disposition towards justice and equity towards all his subjects. He turned a deaf ear to the words of flatterers and dismissed dishonest informers. His zeal for the faith was so great that he hid himself away in Hunstaton for an entire year in order that he might learn the entire Psalter by heart, a deed which he accomplished with skill. Though this pious king desired solitude for prayer and penance, it was not to be. In 870, the Danes under Hinguar and Hubba invaded his realms and were only beat back with great effort. But they soon came again with overwhelming forces and forced St. Edmund to come to terms with them. Though he struck up a peace treaty with the Danes, on the way towards Framlingham he was waylaid on the road and taken in chains to the cruel Viking chief Hinguar. Hearing of Edmund's piety, he attempted to get the king to worship the Danish gods, but Edmund declard that his religion was more dear to him than life itself. At this, Hinguar ordered his martyrdom. St. Edmund's martyrdom was as cruel as the Danes themselves. He was taken to Hoxne in Suffolk where he was beaten senseless by oaken cudgels. Then he was tied to a tree and whipped until his flesh hung in tattered shreds from his body. Still clinging to life and calling upon the holy name of Jesus, Hinguar ordered Edmund shot with arrows until he resembled a porcupine. Enraged at his constancy and still finding the breath of life in him, Hinguar finally ordered his head struck off. 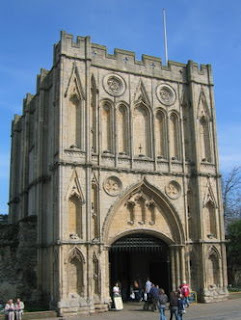 His relics were at first buried at the place of his martyrdom, but in the 10th century they were transferred to Beodricsworth, ever since known as St. Edmundsbury. It was at this location that the famous monastery of Bury St. Edmund's sprung up and flourished. The feast of St. Edmund is kept on November 20th. I am afraid your quote by Bishop Rene Gracida shows a popular misconception. Senator Obama is NOT pro-abortion. There is a difference between being pro-choice and pro-abortion. Just as there is a difference between being pro-birth and pro-life. And perhaps that's why so many informed people of good conscience find it difficult to remain in the Catholic church.